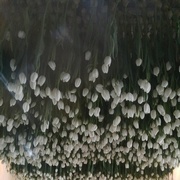 HOW DID YOU DO THAT TULIP CEILING ? Have you ever seen something creative done and wondered how did they do that ??? I know I certainly have. 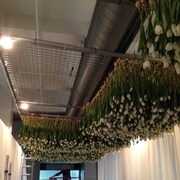 Two weeks ago Westmount Florist was fortunate to have one of my dreams come true. 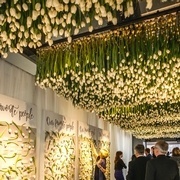 For a few years I’ve been dreaming of creating a ceiling of only tulips for an event. When our friend who is also a client told us their son was getting married on March 25th my eyes lit up. 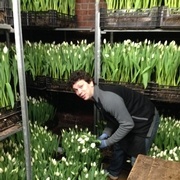 It’s tulip season !!!! 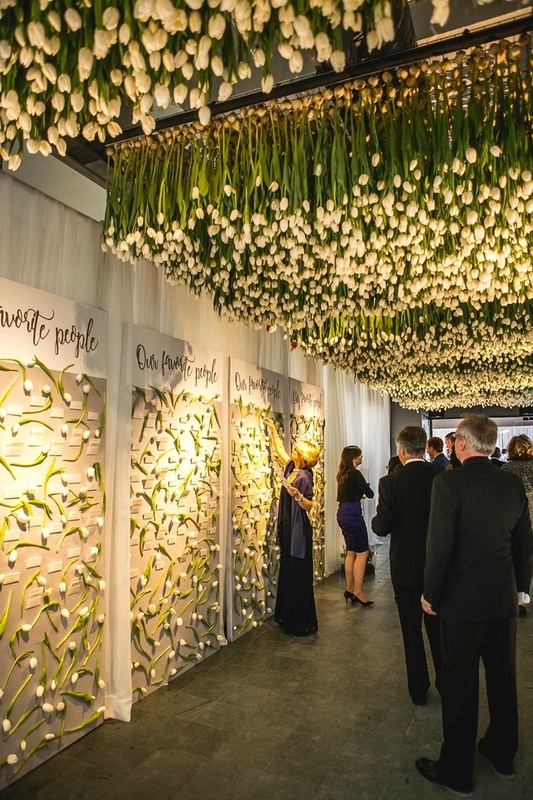 After our initial meeting way back in November I broached the idea of an all white tulip décor and they loved it. So now that the bride, groom, parents were all on board with the idea the planning began……….but only after the busy Christmas season. In January I met with my friend Lorne Levitt of Total Events who is the best at helping my dreams come true. He’s the go to guy for any special “things” we need made to get the job done. We discussed where and how the ceiling would be and after our decision was made he sent his team down to venue to ensure it was feasible. Bingo….we got the ok ! 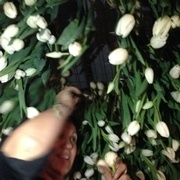 We decided to do six 6’ x 8’ metal grids to hang our tulips on which Lorne had custom made. 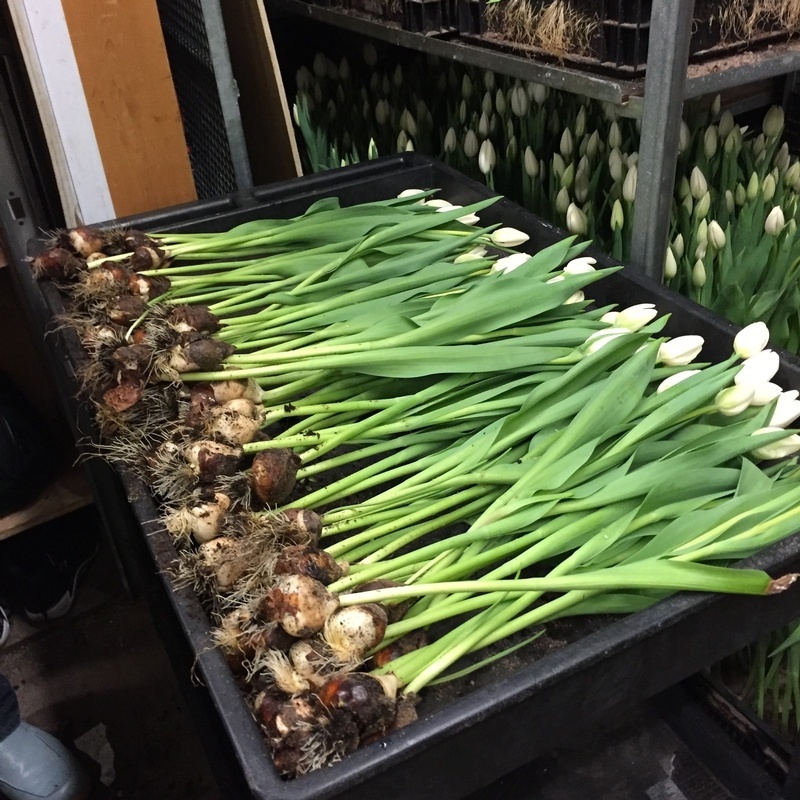 I had measured a tulip with the bulb on it and knew we were needed 25 tulips per square foot…..that meant we needed 7200 open tulips. 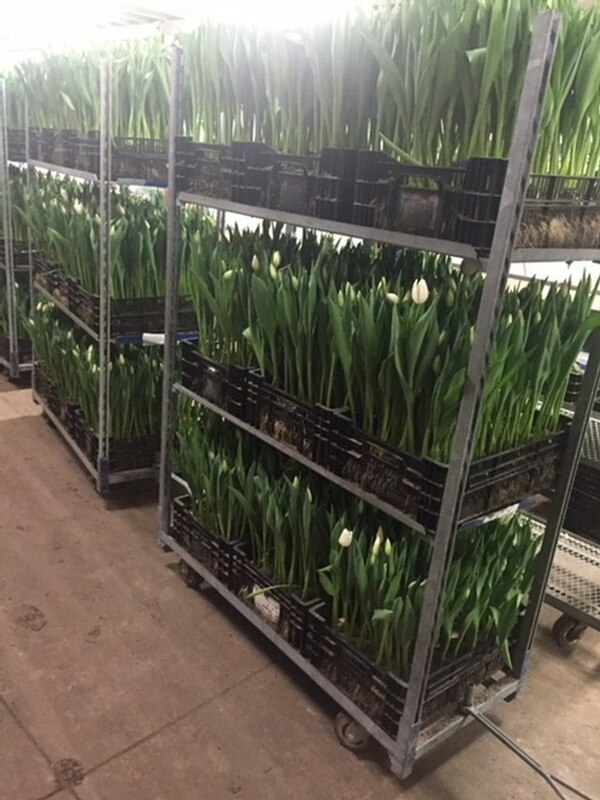 I then contacted the tulip grower in Niagara, Ontario, Canada and let him know we’d been needing a lot of tulips in March. 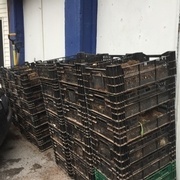 He grows his tulips in black plastic crates (see photo) and told me each crate would have at minimum 100 tulip bulbs in each. 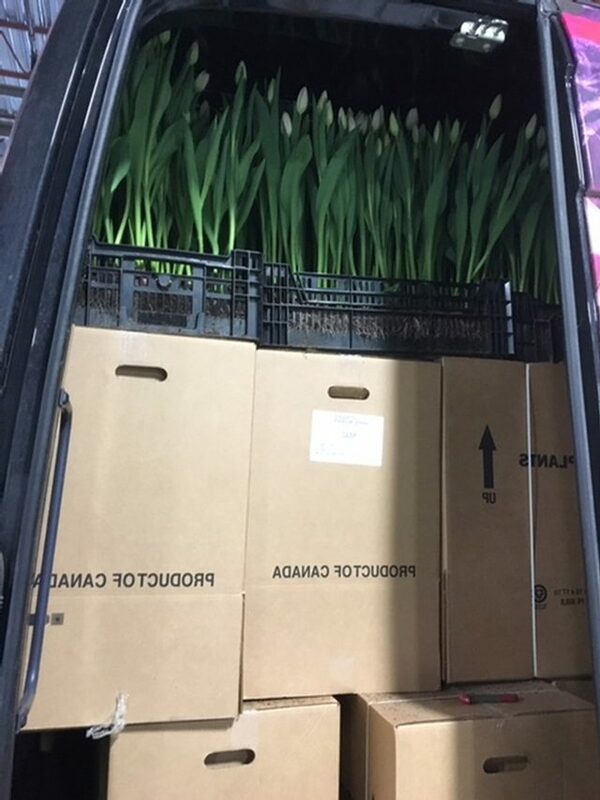 We agreed to 80 crates which would give us 8000 tulips. 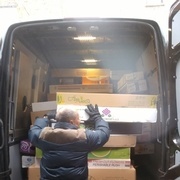 After numerous calls to Peter my tulip guy we decided to get the crates delivered 8 days before installation. This meant we had to “pull” each tulip bulb out as the tulip opened and leave the rest in the crate until they were ready to be “pulled”. 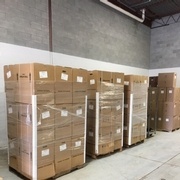 Day 1 – Our large truck makes the trip out to the wholesaler in Montreal where the shipment of 80 crates have been delivered from Niagara. 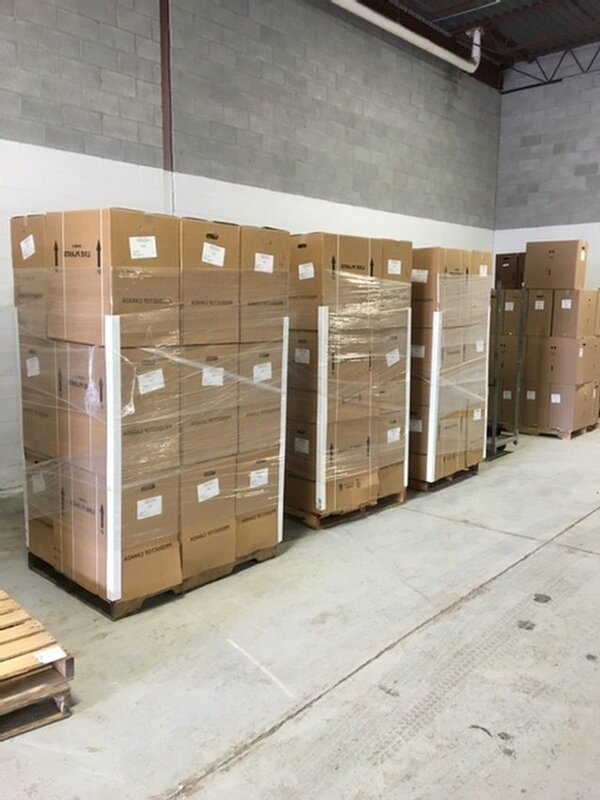 This takes 2 trips in our Sprinter truck so you can imagine how big these crates are. 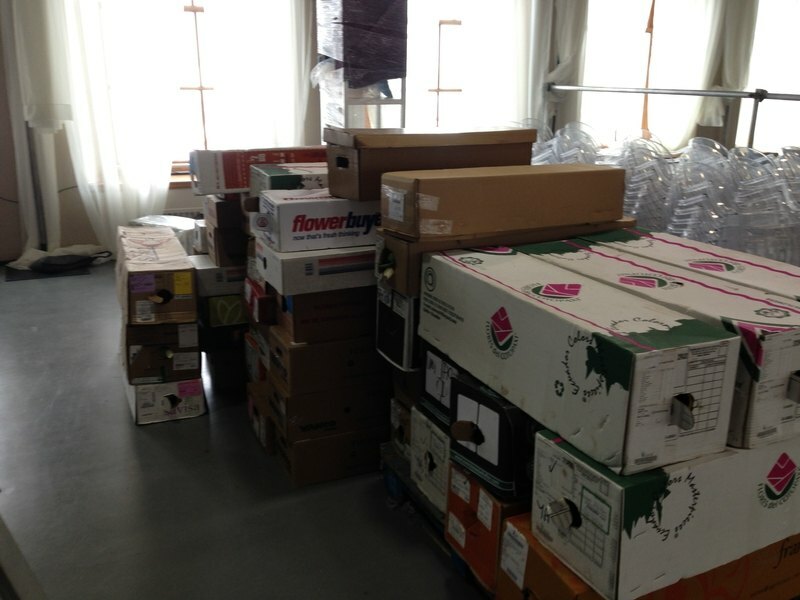 The crates come in large boxes which all had to be opened and crates removed and stored in our back area with no refrigeration since we needed them to start opening and showing color. 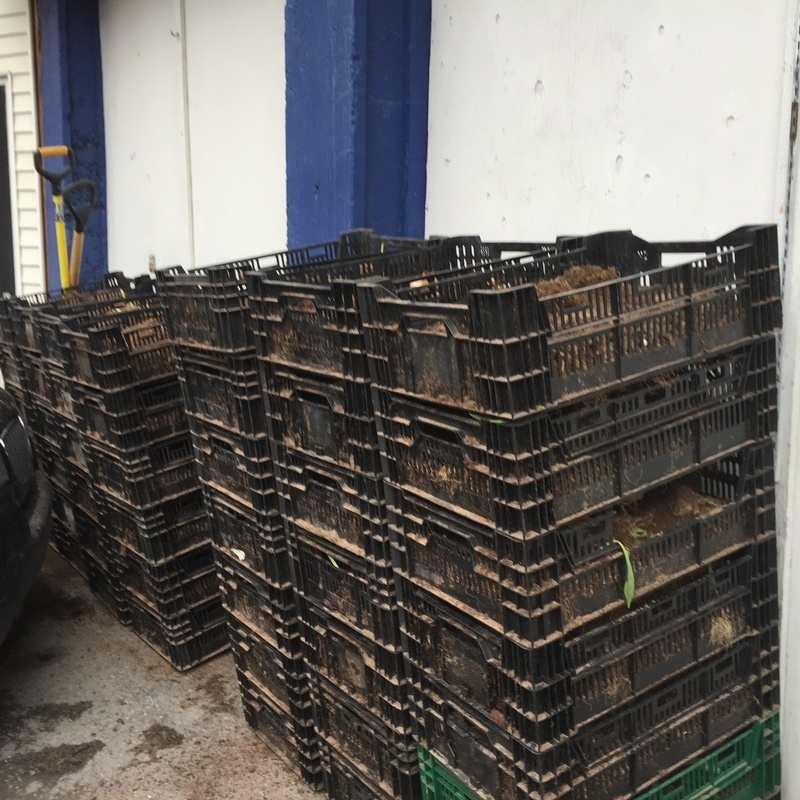 Day 2 – We water most of the crates and the wait for them to start to show some color. 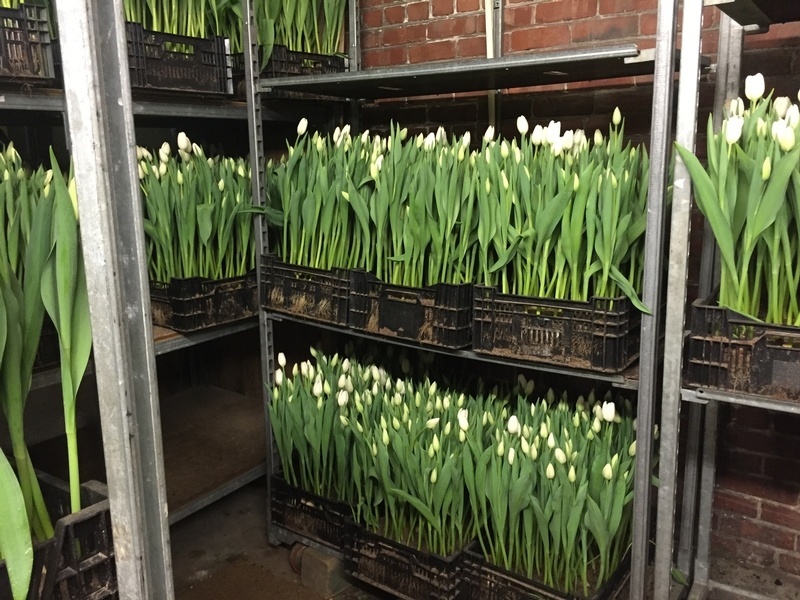 Day 3 – Not quite ready, it’s now the weekend and we have to wait 2 days to see our tulips next. Day 4 – Our day off. 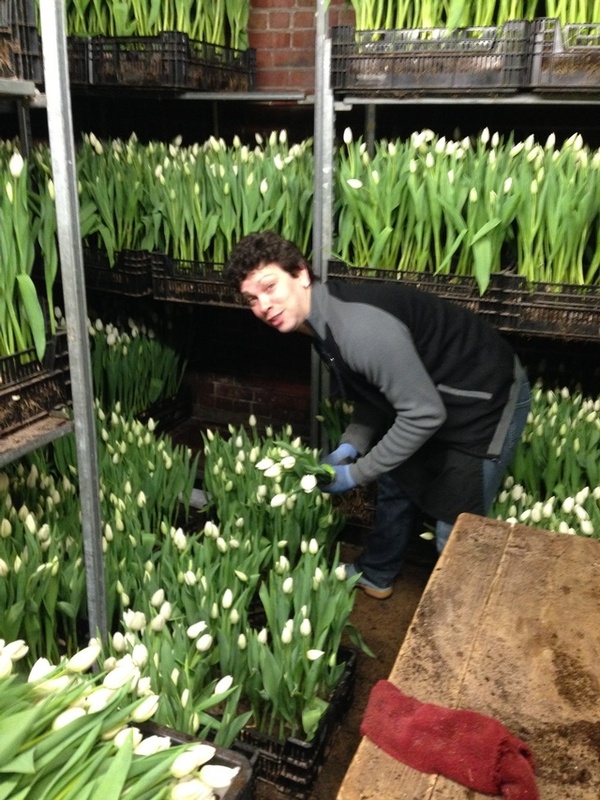 Day 5 – We arrive at work and are thrilled to see our tulips have begun to show some color. We start the pulling process. 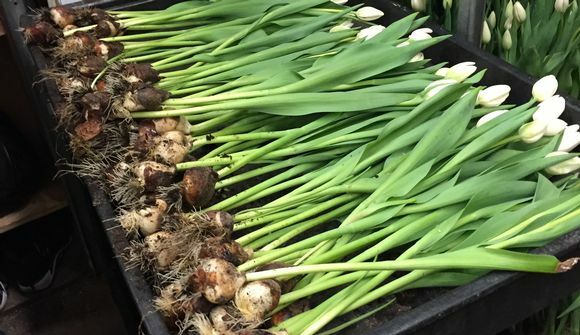 One by one we pull all tulips from the bottom where the bulb is out of the soil. 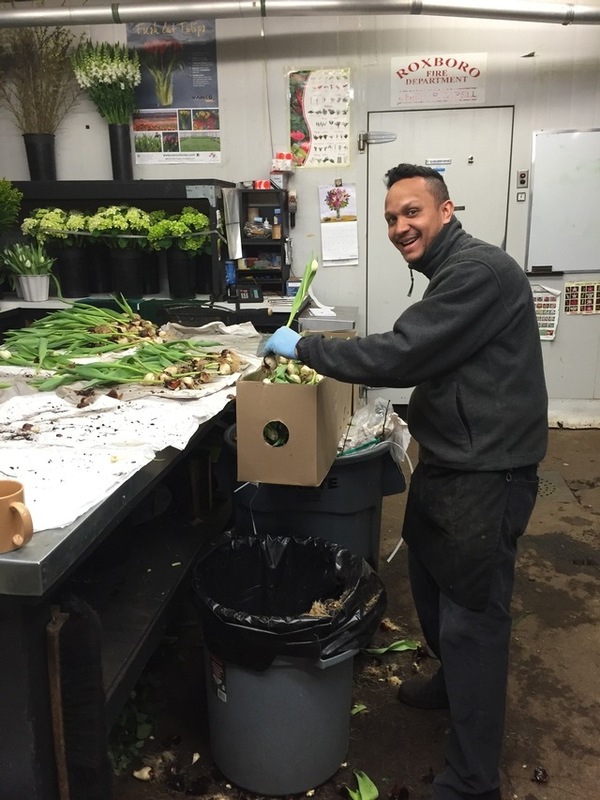 We then clean off all soil and clean the roots and lay them in a large box and store them in our cooler at 1 degree Celsius. Day 6 – Pulling day again ! 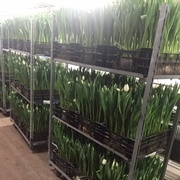 Day 7 – After spending the last 2 days pulling, cleaning and storing we pretty much have all the tulips ready and there are lots and lots of boxes in our cooler. Day 8 – We load up the big truck again and are on our way to hang. 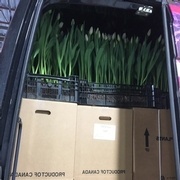 Once we arrive at the venue which is Marche Bonseours in Old Montreal its time to unload the tulips on the loading dock, get them into the freight elevator then unload on the 3rd floor. 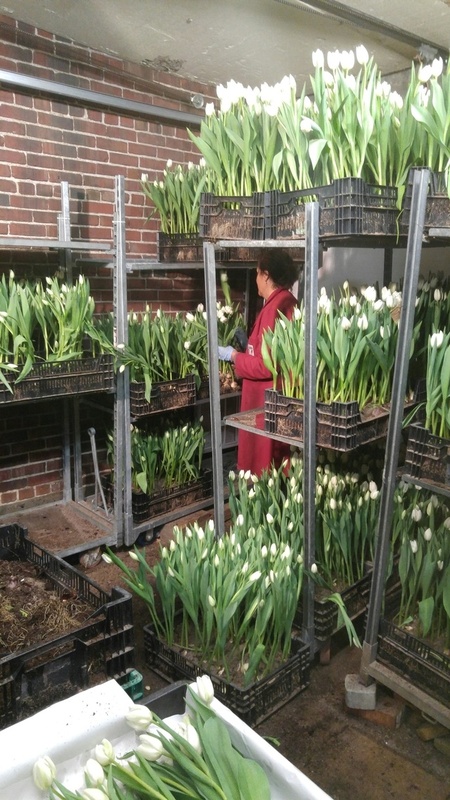 We are thrilled to see our cherry picker is there waiting for us to climb on up and start hanging our tulips one by one. A big shout out to the best event planner in Montreal, Marsha Brumer of MBEvents who makes our job easy by her amazing planning. When we arrive at an event everything is in place for us to do our job and we appreciate her so much. 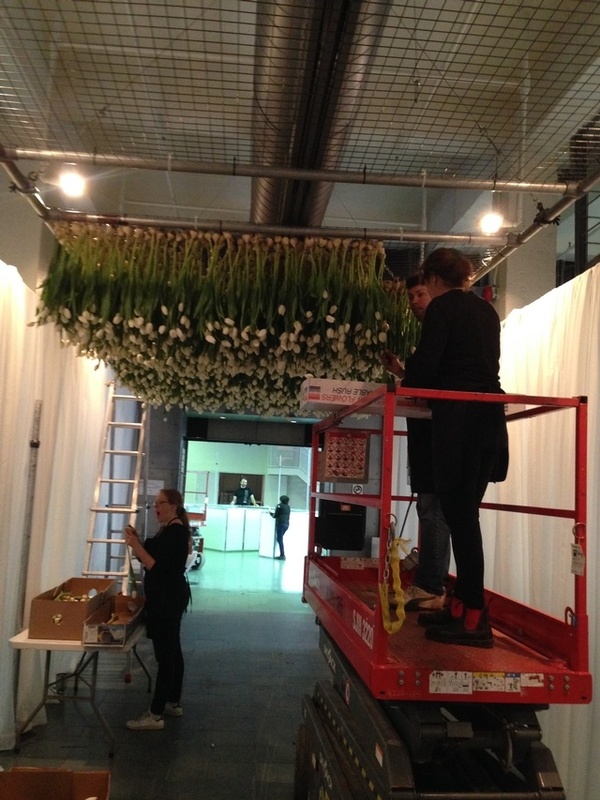 We had a team of 5 people, 2 on the cherry picker and 3 on the ground putting the hooks into the bulbs. You are probably wondering what we used as hooks ! Dauno one of our amazing designers came up with the idea to use a paper clip which we opened up on one end and left the top piece like a hook. 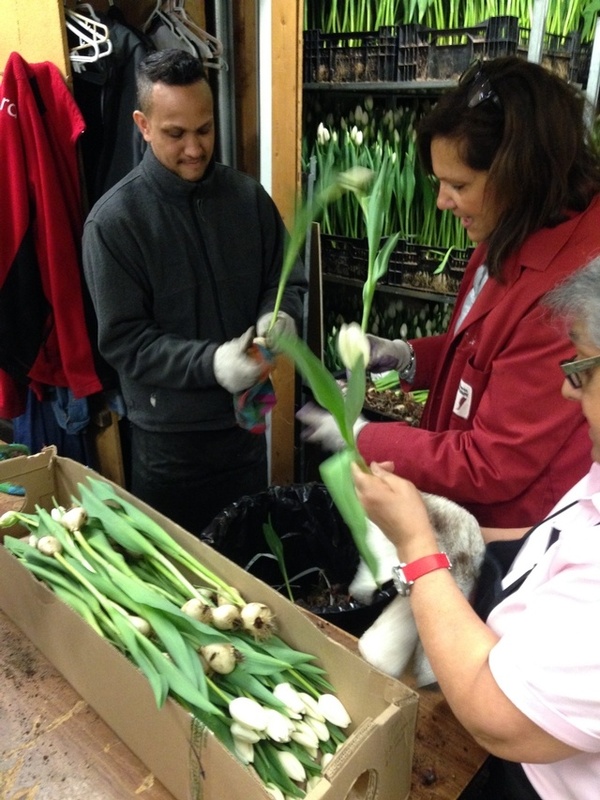 The one end was pushed into the bulb by our awesome team of David L., Natasha and Stephanie. We even got some much needed help from my partner and brother Steve who arrived to see how we were doing at 6pm. 2 of our staff had left already and as we ran out of steam Steve got there just in time to help! 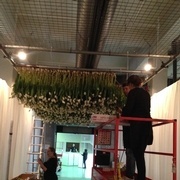 We began the hanging at 12:30 pm on the Friday before the wedding and it took a total of 42 man hours to complete. 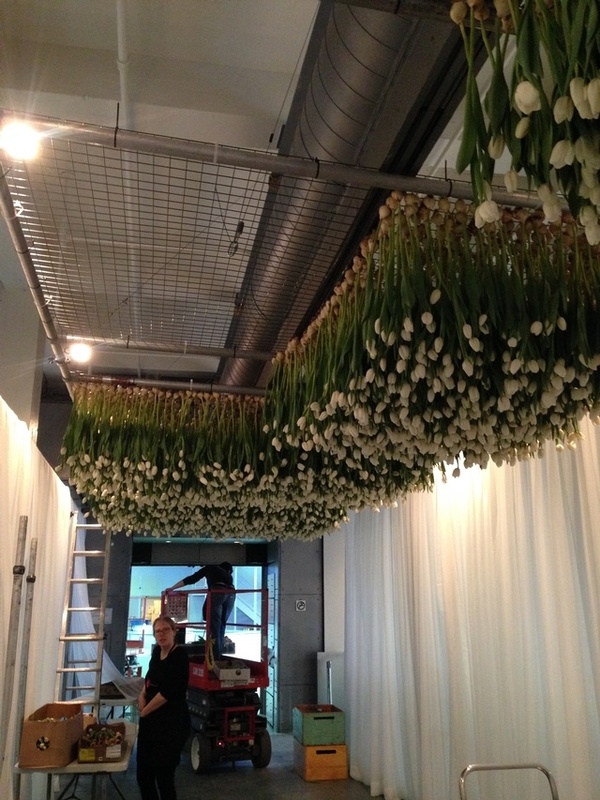 We could have done this 2-3 days earlier as we’d been testing out hanging tulips for months and knew they would last. We’ve had lots of questions about how long this would last ? How did you do it ? How much did it cost ? etc…….and hopefully we’ve answered your questions with this blog. I unfortunately will not say how much out of respect for our wonderful clients but I’m sure if you ask them they will tell you it was worth every penny cause the impact it created was unforgettable. 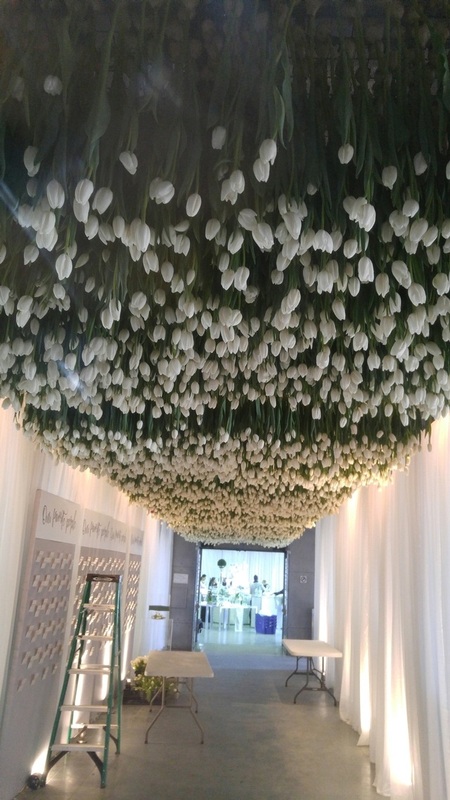 As guests walked up a long staircase we could see their expressions as they spotted the first few tulips hanging…….I only wish we had a camera there to capture it !!! Next time ??? 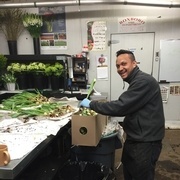 Never because at Westmount Florist we believe that something this special belongs to that bride and groom and so we did it once and never again. But we encourage you all to do it someday and would be more than happy to answer any questions if you need more information. Send us a message! P.S. I have to admit I was a tad nervous and had many sleepless nights over using one type of flower but thanks to so many amazing people it all worked out. P.P.S. 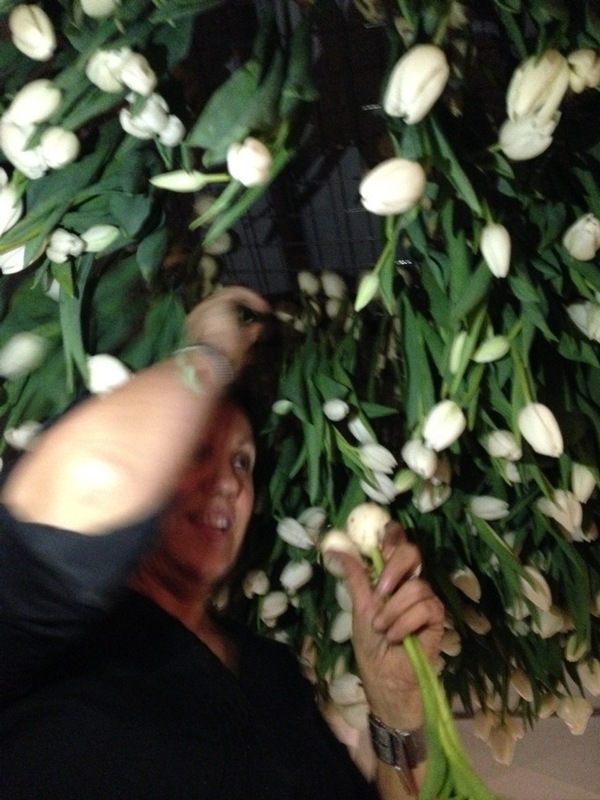 We are proud to say that this was totally Canadian wedding…..all tulips were from Ontario and PEI. Go Canada Go !! !